Massimiliano Allegri praised Cristiano Ronaldo’s leadership skills as Juventus beat Cagliari 3-1 for their 10th win in 11 games to maintain their six-point cushion at the top of Serie A on Saturday. Paulo Dybala scored after just 44 seconds, with a Filip Bradaric own-goal accounting for Juventus’ second after 39 minutes, two minutes after Joao Pedro had pulled the Sardinians level. 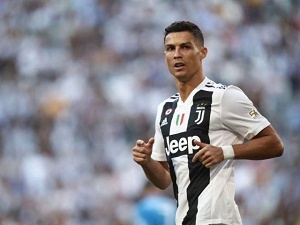 Ronaldo failed to add to his seven-goal league tally for new club Juventus with the Portuguese superstar hitting the woodwork before next week’s Champions League visit by former club Manchester United. But the 33-year-old’s pass across goal set up Colombian Juan Cuadrado for his first of the season three minutes from time in the Allianz Stadium. Juventus have 31 points from 11 games with Inter and Napoli both on 25 points. It is the best ever start to a season for the Turin giants who have drawn just one game against Genoa. Earlier, Inter Milan crushed Genoa 5-0 to reclaim second spot on goal difference ahead of Napoli, who had eased past Empoli 5-1 on Friday, and keep the pressure on the seven-time reigning champions. Wins by the top three were a boost before next week’s Champions League fixtures, with Inter Milan at home against Barcelona and Napoli hosting Paris Saint-Germain.